In theory, to 12 of the most deserving officers and men of any rank within any branch of the Wehrmacht, Waffen-SS or the auxiliary service organizations, awarded post-WWII pending an Axis victory. In practice, an exception was made and only one award was ever presented. Continued performance of outstanding actions of combat bravery above and beyond the call of duty. The Knight's Cross with Golden Oakleaves, Swords and Diamonds was worn in the same manner as the Knight's Cross with Oakleaves, Swords and Diamonds, the only difference being that the cluster of inlaid diamonds, oakleaves and swords above the Knight's Cross itself was made of gold rather than silver. The Knight's Cross with Golden Oakleaves, Swords and Diamonds was the highest single grade of the Knight's Cross of the Iron Cross, and was awarded only once during WWII - an exception to the rule for this award which was only to be awarded 12 times once WWII ended. 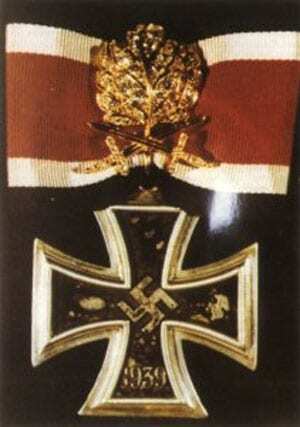 It was awarded to Hans Ulrich Rudel in honor of his unrivaled heroism as a Luftwaffe Stuka pilot. Rudel was responsible for the destruction of 530 Soviet tanks, enough tanks for five complete Soviet Tank Corps! He also destroyed 150 anti-aircraft and anti-tank positions, 800 motor vehicles, the Soviet Battleship Marat, a Soviet Cruiser, a Soviet Destroyer, 70 Soviet landing craft, and numerous bridges and bunkers. He also heavily damaged another Soviet Battleship, the October Revolution. 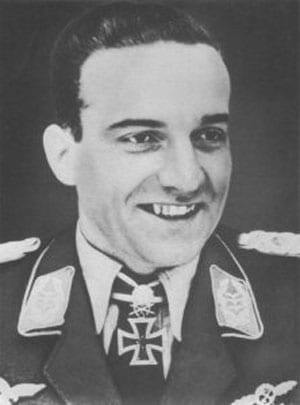 Rudel flew 2,530 combat missions, claimed 11 air victories in his Stuka, and was shot down 30 times.